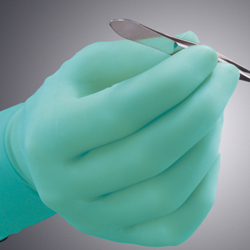 Medline's powder-free, latex Aloetouch® surgical gloves are perfect for all general procedures. The Aloetouch surgical glove has a proprietary inner polymer coating which allows for easy donning and double gloving. The inner coating also contains pure Aloe Vera which helps to moisturize and soothe dry, irritated hands.